This summer I have been noticing bees. They are one of the few things that make me feel happy these days. The spectre of bee colony collapse disorder still terrifies me. So every time I see a bee pollinating flowers, I feel a pang of gratitude. I depend on bees to live. Without their hard work many fewer crops would grow, and I would go hungry and/or be thrown into conflict over food shortages. Why should I not feel thankful? It is true they act in their own self-interests, but society as a whole benefits. Ayn Rand would be proud. But in addition to being useful bees are cute. They are small and fuzzy. 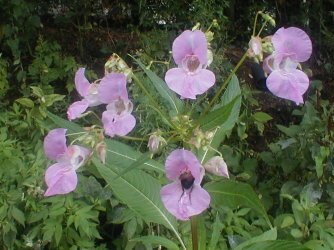 They work so hard to get into flowers -- they will push past half-opened petals to get the sweet nectar inside. The pollen-baskets on their legs remind me of saddlebags. I guess it is voyeuristic, but I have taken to stopping and watching when I see bees collecting nectar. Even when I am late for work I will often pause and watch the bees for a minute before rushing off again. Bees used to scare me -- I used to worry a lot about being stung. I am still cautious not to pet the bees or disturb them when I see them, but I don't stand paralyzed with caution any more. No doubt this means I will get stung sooner or later. I don't think I have ever been stung by a bee, so for all I know I have a deadly allergy. For some reason I am still scared of wasps. A few days ago a wasp found some jam I had been eating, and I sat very very still until she flew away. I don't know whether I fear wasps more because they can sting multiple times, or because they are not as fuzzy and cute. I know that bees are not the only pollinators around. Maybe if the bees die out other insects will eventually fill their ecological niches. I don't care. I am still grateful for bees. I am also grateful that urban beekeeping has become trendy. The lovely Ferrett Steinmetz and his lovely wife Gini have started raising bees this year, and they have been posting videos of their adventures. I don't know that I would want to be a beekeeper (it's a hobby that appears rather anxiety-provoking) but I have learned a whole lot about bees from these videos. A few months ago I got a fancy 1.3 megapixel digital camera. Once in a while I try to take pictures of bees. Most of the pictures are terrible, but here are a couple that are less awful than the rest. You can click the pictures to get bigger versions of them. I saw these pretty pink orchids growing in a ditch beside some railroad tracks. The orchid at the bottom looks like it is digesting some poor insect, but in fact it is being pollinated by a bee. The fuzzy yellow/black blotch in the centre of this photo is a bee pollinating some mint. I guess the bee thinks we don't have enough mint at our community garden. 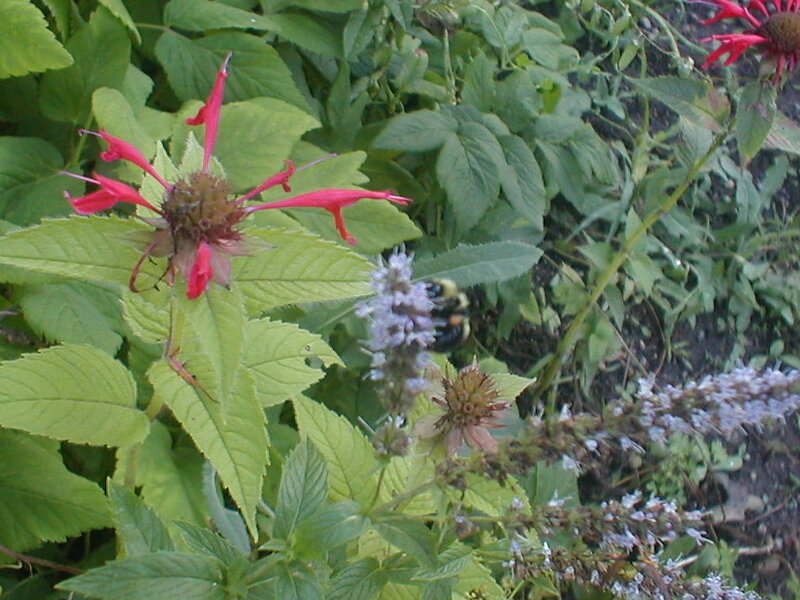 The plant with the ragged red flower is bergamot, which is another member of the mint family.